The follow codes are copied from the Structural Pest Control Act of California. Termite inspectors in California need to fully understand the following codes to issue proper inspection reports. If you want to be an expert termite report writer, then study the following codes and if there is anything you don’t understand take the time needed find the answers you need. §1990. Report Requirements Under Section 8516(b) 1-9, Inclusive. (1) Structural pest control license number of the person making the inspection. (2) Signature of the Branch 3 licensee who made the inspection. (3) Infestations, infections or evidence thereof. (4) Wood members found to be damaged by wood destroying pests or organisms. (1) Faulty Grade Level. A faulty grade level exists when the top of any foundation is even with or below the adjacent earth. The existing earth level shall be considered grade. (2) Inaccessible subareas or portions thereof and areas where there is less than 12 inches clear space between the bottom of the floor joists and the unimproved ground area. (3) Excessive Cellulose Debris. This is defined as any cellulose debris of a size that can be raked or larger. Stumps and wood imbedded in footings in earth contact shall be reported. (5) Commonly controllable moisture conditions which would foster the growth of a fungus infection materially damaging to woodwork. (c) When an infestation of carpenter ants or carpenter bees is found in a structure, control measures may be applied by companies holding a Branch 2 or Branch 3 registration certificate. If a Branch 3 licensee discovers an infestation or evidence of carpenter ant or carpenter bee infestation while performing an inspection pursuant to section 8516 of the code, he or she shall report his or her findings and make recommendations for controlling the infestation. and steps, stairways, air vents, abutments, stucco walls, columns, attached structures or other parts of a structure normally subject to attack by wood-destroying pests or organisms. (g) Information must be reported regarding any wooden deck, wooden stairs or wooden landing in exterior exposure attached to or touching the structure being inspected. Portions of such structure that are not available for visual inspection must be designated as inaccessible. NOTE: Authority cited: Sections 8525 and 8538(c), Business and Professions Code. Reference: Sections 8516 and 8538, Business and Professions Code. 1. Amendment of subsections (h), (i), (j) and new subsection (k) filed 12-27-73; designated effective 3-1-74 (Register 73, No. 52). For prior history, see Register 64, No. 11. 2. Amendment filed 5-22-75; effective thirtieth day thereafter (Register 75, No. 21). 3. Amendment filed 5-19-78; effective thirtieth day thereafter (Register 78, No. 20). 4. Amendment of subsection (k) filed 5-8-80; effective thirtieth day thereafter (Register 80, No. 19). 5. Amendment filed 9-22-83; effective thirtieth day thereafter (Register 83, No. 39). 6. Amendment of subsection (a) filed 6-17-85; effective thirtieth day thereafter (Register 85, No. 25). 7. Amendment of subsections (a) and (a)(4), new subsection (c) and subsection relettering, and new subsection (f) filed 3-13-96; operative 4-12-96 (Register 96, No. 11). 8. Change without regulatory effect amending subsection (c) filed 5-20-96 pursuant to section 100, title 1, California Code of Regulations (Register 96, No. 21). 9. New subsection (g) filed 4-28-98; operative 5-28-98 (Register 98, No. 18). NOTE: Authority cited: Section 8525, Business and Professions Code. Reference: Sections 8510, 8516.1, 8538 and 8560, Business and Professions Code. 1. New section filed 3-6-95; operative 4-5-95 (Register 95, No. 10). 2. Change without regulatory effect repealing section filed 3-26-2002 pursuant to section 100, title 1, California Code of Regulations (Register 2002, No. 13). §1991. Report Requirements Under Section 8516(b)10. (1) Comply with the provisions of section 2516(c)(1) of Title 24 of the California Code of Regulations. (2) Remove from the subarea all excessive cellulose debris in earth contact. This excludes shavings or other cellulose too small to be raked or stored goods not in earth contact. Stumps and wood imbedded in footings in earth contact shall be treated if removal is impractical. (3) When evidence of moisture, infestations or infections exists as a result of faulty grade levels, earth fill planters or loose stucco, a recommendation shall be made to correct the condition. Any method of controlling infestations arising from these conditions is considered adequate if the infestation is controlled. (4) Comply with the provisions of section 2516(c)(6.1) of Title 24 of the California Code of Regulations (Effective July 1992). (5) Structural members which appear to be structurally weakened by wood-destroying pests to the point where they no longer serve their intended purpose shall be replaced or reinforced. Structural members which are structurally weakened by fungus to the point where they no longer serve their intended purpose shall be removed or, if feasible, may remain in place if another structural member is installed adjacent to it to perform the same function, if both members are dry (below 20% moisture content), and if the excessive moisture condition responsible for the fungus damage is corrected. Structural members which appear to have only surface fungus damage may be chemically treated and/or left as is if, in the opinion of the inspector, the structural member will continue to perform its originally intended function and if correcting the excessive moisture condition will stop the further expansion of the fungus. (6) Comply with the provisions of section 2516(c)(6) of Title 24 of the California Code of Regulations. (7) Comply with the provisions of section 2516(c)(4) of Title 24 of the California Code of Regulations. When a complete inspection is performed, a recommendation shall be made to remove or cover all accessible pellets and frass of wood-destroying pests. When a limited inspection is performed, the inspection report shall state that the inspection is limited to the area(s) described and diagrammed. A recommendation shall be made to remove or cover all accessible pellets and frass of wood-destroying pests in the limited areas. The limited inspection report shall include a recommendation for further inspection of the entire structure and that all accessible evidence of wood-destroying pests be removed or covered. (9) For the extermination of subterranean termite infestations, treat an infested area under the structure when subterranean termite tubes are found connected to the ground or when active infestations are found in the ground. Subterranean termite tubes shall be removed where accessible, except where a licensee is using an above ground termite bait station that requires the use of the termite tubes to be effective. Where a licensee is using an above ground termite bait station that requires the use of termite tubes to be effective, subterranean termite tubes can remain in place for the duration of the licensee’s use of the termite bait stations. At the conclusion of the treatment, the subterranean termite tubes shall be removed. (10) Comply with the provisions of section 2516(c)(2) of Title 24 of the California Code of Regulations. (11) Correct any excessive moisture condition that is commonly controllable. When there is reasonable evidence to believe a fungus infection exists in a concealed wall or area, recommendations shall be made to open the wall or area. (b) Preconstruction application of termiticide for protection from subterranean termites shall not be made at less than the manufacturer’s label specifications. (c) If in the opinion of the inspector a building permit is required, it must be noted on the wood destroying pests and organisms inspection report (Form No. 43M-41 as specified in section 1996 of the California Code of Regulations). NOTE: Authority cited: Section 8525, Business and Professions Code. Reference: Section 8516, Business and Professions Code. 1. Amendment filed 9-16-59; effective thirtieth day thereafter (Register 59, No. 16). 2. Amendment filed 5-19-64; designated effective 9-1-64 (Register 64, No. 11). 3. Amendment of subsections (a)(3), (9) and new (b) filed 1-2-68; effective thirtieth day thereafter (Register 68, No. 1). 4. Amendment filed 12-27-73; designated effective 3-1-74 (Register 73, No. 52). 5. Amendment of subsection (a) filed 5-8-80; effective thirtieth day thereafter (Register 80, No. 19). 6. Amendment filed 7-3-80; effective thirtieth day thereafter (Register 80, No. 27). 7. Editorial correction of subsection (a)(12)(Register 80, No. 36). 8. Amendment of subsection (a)(12) filed 9-22-83; effective thirtieth day thereafter (Register 83, No. 39). 9. Amendment of subsection (a)(8) filed 2-13-87; effective thirtieth day thereafter (Register 87, No. 8). 10. Amendment of subsections (a) and (a)(9) and repealer and adoption of subsections (a)(1), (a)(4), (a)(6), (a)(7), and (a)(10) filed 11-15-91; operative 12-16-91 (Register 92, No. 8). 11. Repealer of subsection (a)(8) and new subsections (a)(8)(A)-(C) filed 3-30-92; operative 4-29-92 (Register 92, No. 15). 12. Amendment of subsections (a)(2) and (a)(8), repealer of subsection (b) and new subsection (b) filed 3-13-96; operative 4-12-96 (Register 96, No. 11). 13. Amendment of subsection (a)(5) filed 4-3-96; operative 5-3-96 (Register 96, No. 14). 5-15-2000 pursuant to section 100, title 1, California Code of Regulations (Register 2000, No. 20). 16. Amendment of subsection (a)(8)(C)3. filed 6-26-2003; operative 7-26-2003 (Register 2003, No. 26). 17. Amendment of subsection (a)(9) filed 12-30-2005; operative 1-29-2006 (Register 2005, No. 52). 18. Repealer of subsections (a)(13)-(a)(13)(C) filed 3-21-2006; operative 4-20- 2006 (Register 2006, No. 12). §1991.1. Report Requirements Under Section 8516.1(c)(8). NOTE: Authority cited: Section 8525, Business and Professions Code. Reference: Sections 8510 and 8516.1, Business and Professions Code. In addition to the recommendations required in section 1991, the report may suggest secondary recommendations. When secondary recommendations are made, they shall be labeled as secondary recommendations and included as part of the inspection report with a full explanation of why they are made, with the notation that they are below standard measures. If secondary recommendations are performed, any letter of completion, billing or other document referring to the work completed, must state specifically which recommendations were secondary and below standard and specify the name of the person or agency requesting completion of the secondary recommendations. 1. New sections filed 9-16-59; effective thirtieth day thereafter (Register 59, No. 16). 2. Amendment filed 5-19-64; designated effective 9-1-64 (Register 64, No. 11). 3. Amendment filed 9-22-83; effective thirtieth day thereafter (Register 83, No. 39). 4. Amendment filed 9-20-90; operative 10-20-90 (Register 90, No. 44). 5. Amendment filed 12-7-92; operative 1-19-93 (Register 92, No. 51). All of the following reports must be in compliance with the requirements of Section 8516 of the code. All reports must be on the form prescribed by the board and filed with the board with stamps affixed. (b) A complete report is the report of an inspection of all visible and accessible portions of a structure. (c) A limited report is the report on only part of a structure. Such a report shall have a diagram of the area inspected and shall specifically indicate which portions of the structure were inspected with recommendation for further inspection of the entire structure and the name of the person or agency requesting a limited report. (d) A supplemental report is the report on the inspection performed on inaccessible areas that have been made accessible as recommended on a previous report. Such report shall indicate the absence or presence of wood-destroying pests or organisms or conditions conducive thereto. This report can also be used to correct, add, or modify information in a previous report. A licensed operator or field representative shall refer to the original report in such a manner to identify it clearly. (e) A reinspection report is the report on the inspections of item(s) completed as recommended on an original report or subsequent report(s). The areas reinspected can be limited to the items requested by the person ordering the original inspection report. A licensed operator or field representative shall refer to the original report in such a manner to identify it clearly. 1. New section filed 9-16-59; effective thirtieth day thereafter (Register 59, No. 16). 4. Amendment of section heading and section filed 3-13-96; operative 4-12-96 (Register 96, No. 11). 5. Amendment of subsections (d) and (e) and new form filed 8-12-96; operative 9-11-96 (Register 96, No. 33). 6. Amendment of first paragraph filed 3-21-2006; operative 4-20-2006 (Register 2006, No. 12). 1. New section filed 7-6-2005; operative 8-5-2005 (Register 2005, No. 27). (2) an “in-ground bait station” which shall mean any device containing a material to attract and or monitor wood destroying pests, or containing a pesticide bait to eradicate wood destroying pests, that is placed in the ground. (3) an “in-ground termite monitoring system” is a device placed in the ground to determine the presence or absence of subterranean termites through scheduled periodic inspections. (b) Prior to installation of any termite system, a full or limited inspection of the structure shall be made. NOTE: Authority cited: Section 8525, Business and Professions Code. Reference: Section 8514, Business and Professions Code. 1. New section filed 6-26-2003; operative 7-26-2003 (Register 2003, No. 26). Use of in-ground termite monitoring and/or baiting systems shall be considered a control service agreement as defined by section 8516 of the code. NOTE: Authority cited: Section 8525, Business and Professions Code. Reference: Sections 8516, 8516.1, Business and Professions Code. 1. New section filed 5-19-64; designated effective 9-1-64 (Register 64, No. 11). 2. Repealer filed 9-22-83; effective thirtieth day thereafter (Register 83, No. 39). §1996. Requirements for Reporting All Inspections Under Section 8516(b). (a) A written inspection report conforming to section 8516(b) of the code (See Form No. 43M-41 (Rev. 10/01, required use effective July 1, 2003) at the end of this section) shall be prepared and delivered to the person requesting the inspection, or to the person’s designated agent regardless of whether the registered company has offered to perform the inspection without charge. The granting of permission to make an inspection shall be deemed a request to make an inspection. (b) The failure or refusal of the person ordering the inspection or of his or her designated agent to pay for such inspection or report shall not excuse a registered company which has commenced an inspection from preparing and delivering a report to the person requesting the inspection or the person’s designated agent. 16-2002; operative 1-15-2003 (Register 2002, No. 51). 12. Amendment filed 12-30-2005; operative 1-29-2006 (Register 2005, No. 52). Copyright - TermiteReportWriter.com - All Rights Reserved. What’s next for termite inspection report writing? This site is a free resource for termite inspectors wanting to gain knowledge of termite report writing in California. Contributors to this site have over 25 years of inspection experience in California. 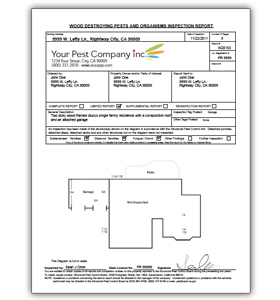 This site is a private resource not connected to or endorsed by the Structural Pest Control Board or Pest Control Operators of California Association.